Also, snap to 0db in simple eq mode is critical... It never sets to 0 now always like 0.000998734586 etc. And complete show stopper for me: no 'show in control centre' gotta show at least same as equalizereveryehere, in cc!!!!!!! Can't wait to get custom bands and parametric working smooth! 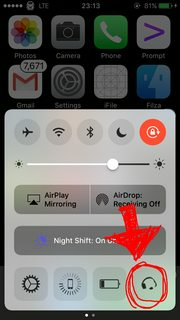 Are you aware of the Activator/FlipSwitch integration? If you install FlipControlCenter, you can press a button in the CC and it brings up an overlay with the controls. I haven't figured out a good design for this yet. It's hard to squish the frequency response curve, with all the buttons and sliders. Another good point, putting it on the todo list. OK, did not know there was a flip switch. Got it! 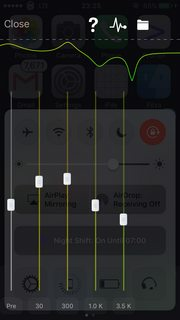 Control center integration on a second swipe a whole page has the advantage of being able to swipe from equalizer back to media controls. 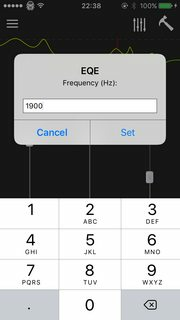 The idea would just be to have the simple EQ bands like in the old EQE, and then in the third swipe a page to have a preset loading saving, basically the same as the old app. I agree it would be much cooler than the current solution. If this was 4 years ago I would have considered it, but these days there's no way I could justify working on a huge feature like this from an economic standpoint, the jailbreak ecosystem is in severe decline. I reckon this feature would require the same amount of work as the entire tweak in its current state. If I added the fully integrated control center, I'd have to rewrite (and maintain) three entirely different UIs, one for iOS 7-9, one for iOS 10, and one for iOS 11. The advantage of the overlay is that I only have to write one UI and it's guaranteed to work on every iOS version. I also don't have to worry about tweak conflicts, which was another headache of control center integration. Getting it to work with a tweak like Horseshoe would be a nightmare. Here's a good feature for where I adjust your preamp slider separately from eq presets: have a toggle to do Eq recall without preamp (ideally putting toggle at preset menu so we can quickly switch between modes). I hope to see your new eq do overlay as now it kicks me to home screen every time I exit with home (unless I tap return to button at top but in the car I'll crash if I have to try to tap that tiny statusbar item instead of home). 6splus iOS 933. But what would trump the whole overlay problem would be your intention of making this a media player and media controller. For instance, Spotify it's OK, but the user interface is not car friendly. I know Spotify parameters can be shared in detail, and then, I play lots of local stuff from my studio. All I really need is to be able to tap for play and stop anywhere on the screen, swipe back in four to go back-and-forth between songs in the queue, and possibly swipe up and down to change volume, for your EQ app long press to pop up the overlay, and double tap to browse not just by ID3 tag but allow by data folder, for local personal music, and swipe right to add to queue. For some reason that very simple set of functions is slightly missing in every player. There's always one of the above obvious and essential things missing. And there must be some public code for this because I've seen it in three different apps exactly the same ui: moving back and forth with in a song the way vox app does, by dragging a very simple bargraph read out of the peak levels of the song. The idea of browsing by data folders is obvious to me but not at all understood by any other app developer yet, i'm guessing they are mainly people that don't play back their own music from their own studio, where ID3 tags are not yet set up, or even when they are I find there never named consistently, so: I collect artists by name for instance Tori Amos. ID3 tags never cut it, as not all of the ID3 tags just say Tori Amos , when I drag a data folder in through the iTunes data area on the other hand, it's very simple: I just browse the folder list, which are artists names, and then select stuff by that artist. But what would trump the whole overlay problem would be your intention of making this a media player and media controller. For instance, Spotify it's OK, but the user interface is not car friendly. I know Spotify parameters can be shared in detail, and then, I play lots of local stuff from my studio. All I really need is to be able to tap for play and stop anywhere on the screen, swipe back in four to go back-and-forth between songs in the queue, and possibly swipe up and down to change volume, for your EQ app long press to pop up the overlay, and double tap to browse not just by ID3 tag but allow by data folder, for local personal music, and swipe right to add to queue. For some reason that very simple set of functions is slightly missing in every player. There's always one of the above obvious and essential things missing. And there must be some public code for this because I've seen it in three different apps exactly the same ui: moving back and forth with in a song the way vox app does, by dragging a very simple bargraph read out of the peak levels of the song. The idea of browsing by data folders is obvious to me but not at all understood by any other app developer yet, i'm guessing they are mainly people that don't play back their own music from their own studio, where ID3 tags are not yet set up, or even when they are I find there never named consistently, so: I collect artists by name for instance Tori Amos. ID3 tags never cut it, as not all of the ID3 tags just say Tori Amos , when I drag a data folder in through the iTunes data area on the other hand, it's very simple: I just browse the folder list, which are artists names, and then select stuff by that artist. What do you mean by data folder ? Like a file browser like iFile/Filza, basically? Overall focusing on in-car use is a very good point. The file folder thing was how i browse my music collection. I keep my music in folders, one folder for artist. Music players always let you browse your music, but they force you to browse by ID3 tag, all of those media player browsers are file browsers, in fact they are even much more complicated than a simple file browser because they're organizing everything by ID3 tag. All the media players need to do is let me actually browse its applications' data folder where the music is stored,, yes like you would browse the data in filza, but only for the purpose of picking music to queue. I can't post screenshots, nor can I start new threads with this app on this forum. but in landscape on iPhone 6s Plus iOS 9 33, your ui displays portrait but only the top half of the screen with half of the controls cut off. Switch iPhone back to portrait and you're app displays all controls again. Also, your app in overlay mode causes all home screen icons to immediately shut when tapped, except for a few that are residence In memory. Only respring allows me to launch apps again. This is intermittent difficult to reproduce, I can use debugging if you want. I can't reproduce the landscape thing, could you elaborate on what you do? First open it in portrait and mess with some controls in overlay mode. Then switch to landscape and open it again. Gets called off the screen. Actually some time switching it back to portrait it stays off the screen never comes back til I switch apps. I hope you can fix that memory leak: completely prevents the phone from running at all, essentially crashes that entire device. I had a quick lunch icons work perfectly fine for a couple of hours, and then suddenly I music player with died alIng with of everything else except for the browser I was reading, we're not even available in the tasks switchher anymore they were gone. One other alarming artifact happened at the same time: springboard suddenly asked for access to Twitter accounts, and then the microphone! I believe I found the cause of the memory leak. Here is an experimental .deb that completely disables the frequency response curve (the red/yellow/green curve near the top). Let me know if this fixes it for you. Okay, someone in the Discord chat told me that deb fixed it. I've never personally experienced this but I think it's because I have an iPhone 5s/SE and cannot make SpringBoard go into landscape. Anything then we can do here? It even is getting scrambled in portrait mode all of a sudden now, overlay drawing below the cc just happened (once)... Any debugging thing or... Anything? Short of sending you a $1200CDN phone LOL! Well, if you ever do any more developments on this app, my current work around for the screen scrambling is to just long press to open the app in the foreground. That's OK, but I sure hope one day you can get rid of the very quickly growing towards annoying quickly flashing on every start photos of a guy in a suit and another guy baby and white nights to us all!